Welcome to Mizz Information! It’s a blog about social media, community management and the association sector, with the occasional book/movie/random post thrown in for variety’s sake. I like to say that I know a little bit about a lot of things…that’s pretty much what Mizz Information is about. The things I express in this blog are my own personal opinions; I do not represent my employer in any way….just so we’re cIear on that. Maggie McGary is passionate about community management and the way social media is changing everything from traditional media to the workplace to the way businesses are structured. She has deep experience in all facets of digital communication including blogging, social media marketing, community management and web content development. 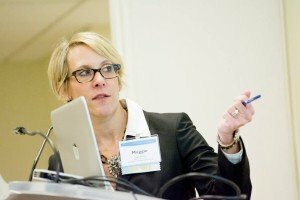 In 2011, Maggie was named the Angerosa Research Foundation’s 2011 Publishing Trendsetter, an award recognizing innovation that advances association publishing. Maggie is an active member of The Community Roundtable, a peer network of community, social media and social business practitioners. In addition to over 10 years experience in the association world, Maggie is a blogger whose guest posts have been featured on numerous blogs including The Washington Post, SocialFishing and Social Media Today. Here’s the non-fancy version: I’ve been blogging for over a decade and can’t seem to stop; I’m an obsessive reader and movie-goer; I’m a mom to two teens and live in the burbs of DC; I’m basically an association lifer; I’m still trying to figure out what I want to be when I grow up even though I’m a middle-aged lady. Still want to know more? Here’s my LinkedIn profile.